Alain is well known internationally and has scaled some of the tallest buildings in the world including the former Sears Tower in Chicago, New York’s Empire State Building and San Francisco’s Golden Gate Bridge. Two years ago he took six hours to summit what currently is the world’s tallest building, the 2,717 foot-tall (828 meter) Burj Khalifa in Dubai (although he did use some safety equipment for that ascent). ‘It’s always a little hard beforehand, …but afterwards I feel great. I feel reborn. I feel free’. In the event it took the Frenchman barely 30 minutes to ascend to the top, pausing only to stoke up the crowd and a couple of times to feign a fall. 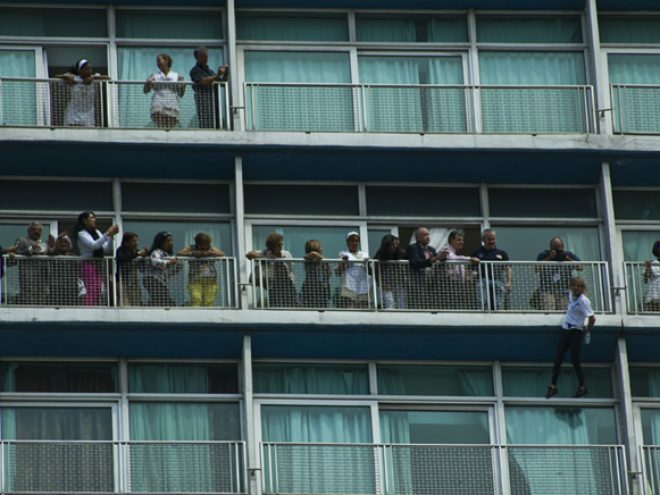 Once he reached the top there was a huge cheer from the assembled crowd, curious tourists peering out of their windows as well as all manner of passersby. The following day Spiderman was obviously feeling restless since he down to Old Havana where he found an elementary school that made up in difficulty what it lacked in height. He took only 15 minutes this time to ascend the three stories of the graceful stone building, which offered little in the way of hand- and footholds.